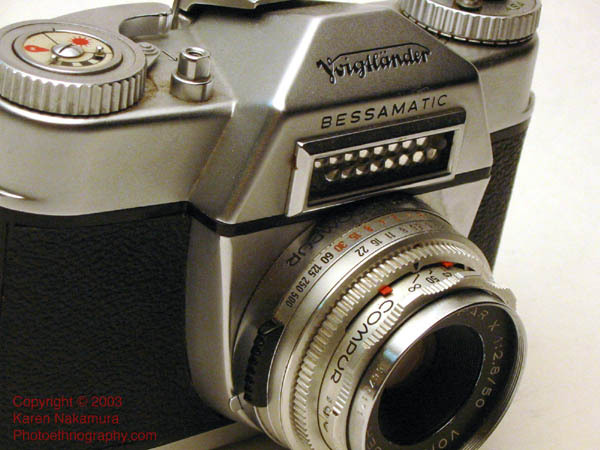 The Voigtländer Bessamatic is a 35mm SLR camera made by the Voigtländer division of the Zeiss-Ikon conglomerate in the late 1950s. It features: 1) an uncoupled selenium cell reflective light meter; and 2) interchangeable lenses - two things that were still very cutting edge in the late 50s. It also had the world's first zoom lens, the 36-82mm Zoomar. Using the text or images on this website without permission on an ebay auction or any other site is a violation of federal law. 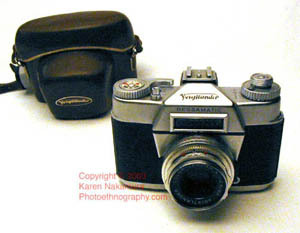 The Voigtlander has an interchangeable lens system, like the Contaflex III/IV. But unlike the Contaflex in which the last couple of lens elements remain behind the Compur shutter in the camera, the entire lens system in the Bessamatic is removable.The Compur shutter remains in the camera. This limits the shorter end of the focal length a bit, but isn't a problem with longer lenses. 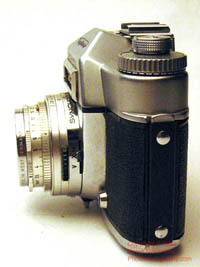 The shortest lens available on the Bessamatic is 35mm. The Bessamatic is unique in having the first zoom lens on a camera, the 36 - 82mm f/2.8 Zoomar. Even now, the Zoomars are quite the collector's item. 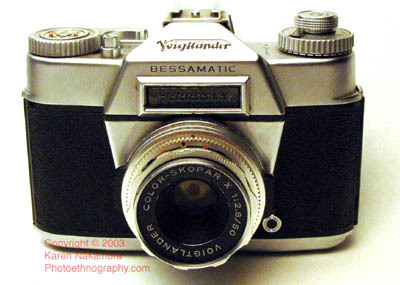 The Bessamatic was oriented to the advanced consumer (nowadays called the prosumer) or professional photographer. It glows with German craftsmanship. The camera winds and fires like a miniature swiss watch. It's of course all-mechanical except for the selenium light cell which sits above the lens on the prism mount. What's also unique with the Bessamatic is the the meter match needle is displayed within the viewfinder (like a Pentax Spotmatic), rather than sitting outside on the camera body. This allows you to meter while shooting. Using the text or images on this website without permission on an ebay auction or any other site is a violation of federal law. Also unique is the depth of field indicators on the lens barrel move while you adjust the aperture! Unlike every other camera where the depth of field indicators are these little markings (f/4, 8, 16) on the focusing scale, the Bessmatic has 2 moving needles that mark the DOF precisely on the focus scale.So no more guessing what the DOF for f/6.3 is. Rather than using cloth focal plane shutters, the Bessamatic borrows the Compur leaf shutter design for the shutter from the Contaflex. This allows the camera to flash sync at all speeds. I personally like leaf shutters and don't mind that the top speed is limited to 1/500 sec. rather than the 1/1000 or 1/2000 available in the focal plane shutters of that era. But then again, I'm an anachronism in myself. 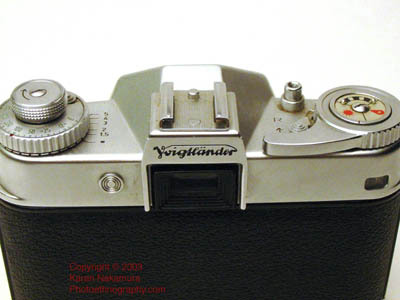 The camera comes with the original Voigtlander case, however the case needs some slight repair. 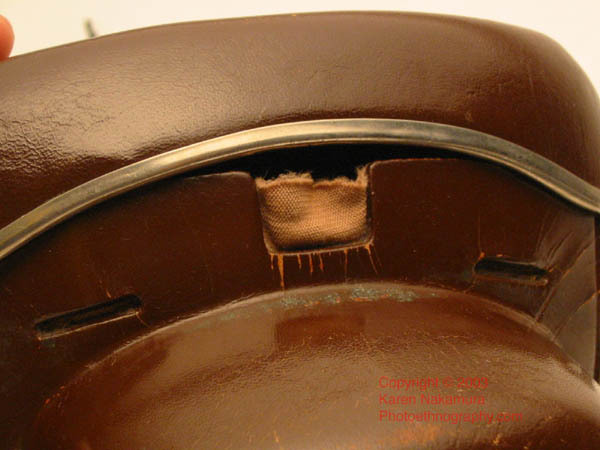 You can either stitch the top back on or epoxy it. It's very minor and can easily be handled. Last modified: Thursday, 11-Mar-2010 01:09:34 EST , [an error occurred while processing this directive] .